This is simply awesome! Today the US Copyright Office issued new rules that make it legal to make changes to your device and software. This means now you can jailbreak your iphone or rip a DVD that you own! Lately the DMCA – The Digital Millenium Copyright Act has come under a lot of criticism since its enactment. The DMCA is the US copyright law that was designed to protect the rights of content owners. It was criticized by activits sighting “fair use” rights that let people who purchase things like DVDs and want to be able to do whatever with them. 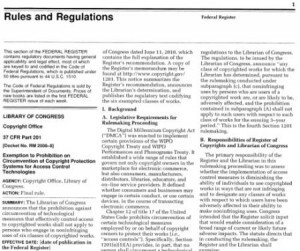 There were two major changes that the US Copyright Office introduced that attracted lots of attention. 2.You can decrypt DVDs in order to use short excerpts for educational, noncommerical, or documentary purposes. The new rules go beyond the phone and the DVD’s. You can now crack the eBook DRM but only in certain instances where the reading function might be disabled. Computer software that is secured with USB dongles were also targetted. Before you are delighted be cautious. The new rules only mean that the US government is no longer criminalizing the act of cracking that encryption in certain circumstances. Previous First HTC Windows 7 phone info leaked – Pictures inside! Next Google Music to be launched in November! I hope that this is true, and not just another fake storie. Cause there have been so many fake stories lately:? I can hardly believe anything anymore???? haha.. true true.. i hope this remains for music and everything else..
I´m ripping all my DVD´s as we speak…. what else will be legal? i hope downloading is legal i wud love that! Forgot to mention that at the White House, we only run GNU/Linux. The Whitehouse.gov website is now on Drupal on GNU/Linux. Yes, I always did rip my DVDs, just like BGates recc’d. This exception means nothing in the way of DVDs. You cant even rip it to make a backup of a DVD you already own. Read the words people. 2.You can decrypt DVDs in order to use SHORT EXCERPTS for EDUCATIONAL, NON COMMERCIAL, or DOCUMENTARY purposes. Thats true there are a few exceptions.. but atleast this is a start! Title: Ripping dvds is legal. Article: Unencrypting is legal for noncommercial purposes.